Mimi Ng, vice-president of sales and marketing for Menkes Developments Ltd., brought a visiting cousin from Hong Kong to see Ng’s condo at Gibson Square in North York. The lobby of the building is grand, with a dramatic two-storey ceiling, large polished columns and curving marble staircase with black roses stencilled in its glass railing. Condo lobbies have changed dramatically from the days when they were small, utilitarian spaces with little charm or character. Today’s versions are spacious with spectacular design features. Bryon Patton, whose firm Bryon Patton and Associates has designed several condo lobbies including Gibson Square’s, says these spaces are getting larger and grander. And we’re not talking just the floor space, says Patton. Ceilings are taller to make a grander impression and to add a sense of expansiveness. Must-have elements include lounge seating, wifi and a concierge station, along with great art, accessories and parcel storage (due to the popularity of online shopping). Patton says the lobby design is a priority for his clients, and if they have to trim the interior budget design, they tend to look for savings in other areas rather than sacrifice elements of the lobby. He says renderings of the lobby figure prominently in any sales material for pre-construction condos. While location and price are still buyers’ key priorities, the lobby and amenity packages can’t help but influence their decision. Wein says a well-designed lobby is an extension of the building, and inspiration is derived from a combination of factors, including the neighbourhood, architecture and the type of people who will live there. One example is Plaza’s Ivory on Adelaide, where the lobby is diminutive by newer standards, yet modern and luxurious, with contrast between light and dark tones and reflective surfaces. It opens to the party room and lounge, with the open-concept layout providing a sense of spaciousness. One of Plaza’s newest projects, Plaza Midtown in the Yonge-Eglinton neighbourhood, has a bigger site, says McLellan, which will allow for a larger, grander lobby with a ceiling height of 14 feet. What’s old is new again at Hamilton’s Residences of Royal Connaught. With occupancy of Phase I taking place this spring and units now available at Phase II, the grand restoration drew on the iconic landmark’s revered history. Its eye-popping lobby features three custom-made chandeliers, 24-foot ceiling and carefully restored original mouldings. The Britt, a Lanterra project under construction on the former site of the Sutton Place Hotel, also conveys a distinct luxury hotel vibe. 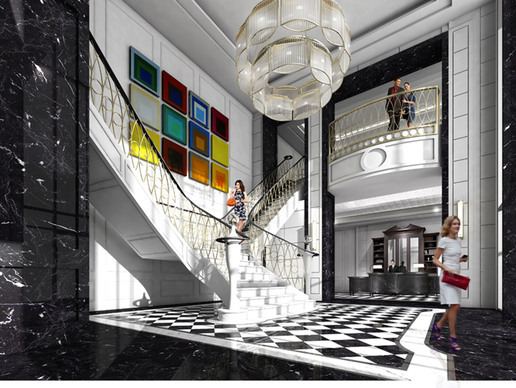 The double-height lobby, designed by Munge Leung, will include a Harlequin-patterned floor, glass chandelier, bold modern art and a staircase that splits in two. Patton took inspiration from a historic rose garden on the Gibson Square site to create the unique rose motif in a glass stairway railing and lobby carpet. At AYC, a building by Metropia and DiamondCorp that will straddle the Annex and Yorkville neighbourhoods, a sculptural element in the lobby will reference Yorkville’s “cool chic” vibe and the artisan element of the Annex. “One great feature that identifies a building, such as a fabulous staircase leading to other amenity spaces, or a water wall or a reflecting pool, all add to a great lobby experience,” notes Patton. That sort of experience can be further enhanced by music and programmed lighting that can set the mood, he notes. 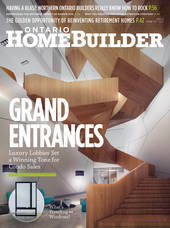 As staircases go, it’s hard to top the wooden work of art that will climb through the atrium of the North Tower of Garrison Point, a five-tower partnership between Fernbrook Homes, Cityzen Urban Lifestyle and DiamondCorp in Toronto’s King West Village area. In line with Garrison Point’s crystalline architecture, Toronto’s Studio Munge pushed the boundaries of urban design in reimagining what a condominium lobby should look and feel like. Beyond being an access point, the light-filled atrium and its impressive stairway act as an energizing hub for activity, with the geometric staircase, revolving onto itself, linking the shared spaces. Those calling the North Tower home will begin moving in in late 2019. 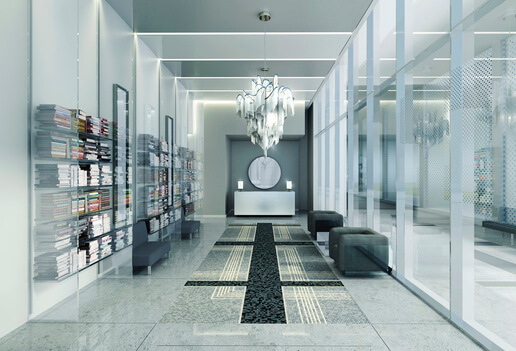 One of Wein’s favourite lobbies is at Great Gulf’s X2 condominium at Jarvis and Charles streets. “Architecturally, it’s an ode to (Ludwig) Mies van der Rohe and meant to flatter the Toronto-Dominion Centre that he designed.” The TD Centre is one of Toronto’s outstanding examples of modernist design, with black steel frames and bronze-coloured curtain wall; the interior finished with travertine, marble, granite and oak. The X2 lobby has voluminous space, large columns, marble and stone and its interior mimics a grand, elegant mid-century building. Great Gulf’s Monde, designed by architect Moshe Sadfie, celebrates life on the Toronto waterfront, with its lobby providing a connection to nature. A glass curtain wall and beautiful green wall that blur the lines between indoor and outdoor are “really an ode to the natural environment,” says Wein. 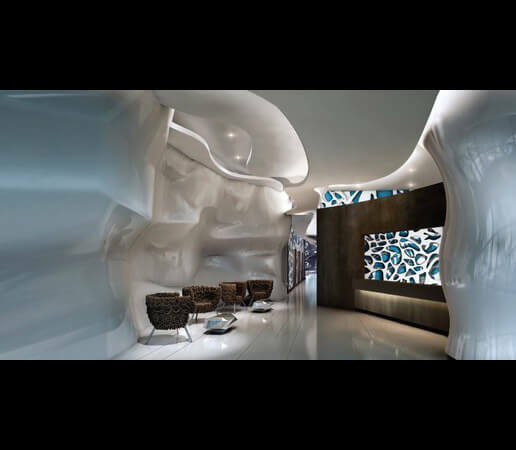 The lobby of Great Gulf’s One Bloor, at the iconic corner of Yonge and Bloor, will convey a futuristic theme with undulating hand-sculpted walls. The intent was to marry the design with the building’s elegant architecture, which resembles a series of horizontal waves reaching to the sky. McLellan says that while price and location are buyers’ top considerations, they are influenced by the design and finishes of amenity spaces, including the lobby (which is included as part of the amenity space budget). One reason is because they may sell in the future and appreciate how a building with a beautiful lobby and amenity areas will enhance the value of their suites, says McLellan. There’s also the pride-of-ownership factor, as owners perceive common spaces are a reflection of their home and status.